06/09/2005 - The Weed Walleye Bite is Here! With the recent consistent warm weather and sunshine the weed growth has been great! 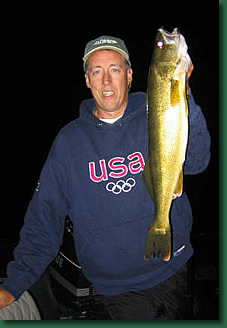 And the Walleye, Pike & Muskie will key on these new weeds in the coming weeks. Right now Walleye can be caught along the edge of the new growth and even up in these new weeds. Start in 10-14 feet of water now. By July 1st you will want to fish in 14-18 feet as these new weeds continue to grow in deeper water. If the weather stays consistant the next two weeks will provide one of the best bites of the year!